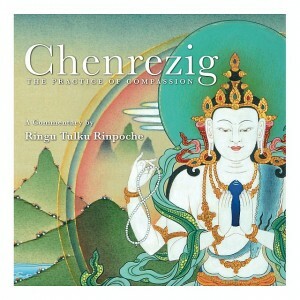 A Commentary by Ringu Tulku Rinpoche. A complete approach for generating and working with loving kindness and compassion in our every day lives, making ourselves, and the world, a better place. The book is beautifully illustrated with colour diagrams to aid visualisation and includes both a drawing and print of a traditional Tibetan painting of Chenrezig, the Buddha of Compassion, by the renowned thangka painter R. D. Salga. The Commentary: Ringu Tulku’s accessible commentary on the sadhana is full of clarity, sound advice and warmth of language on how we can enhance and extend our loving kindness and compassion. How to feel, how to visualize, how to aspire to our true compassionate nature; how to clear our negativities and let our inner selves shine out and benefit ourselves and all other beings; and to open up our hearts and minds to greater loving kindness. The Sadhana: The sadhana is complete with the Tibetan script, the phonetics for this script and the English translation. This makes it easy to understand and to chant or say in Tibetan or English. The Commemoration of Rigul: The third part of this book is commemorating Rigul, Kham, Tibet, the birthplace and homeland of Ringu Tulku Rinpoche, the abbot of Rigul Monastery. It is with such good news of the flourishing of the Dharma in Rigul that this book has come into being. PreviousPrevious project:How can the dying person help the family?